Mt Rainier has been called one of the hardest endurance climbs in the upper 48. At over 14,000 feet it is the tallest mountain in Washington State, its treacherous frosted slopes and glacial like conditions are what draw in the hundreds of climbers year after year to climb the icy volcanic terrain. To locals it is known as The Mountain looming just a few hours south of Seattle, but to climbers it’s more than just a mountain. It’s a stepping stone to the himalayas, a bucket list item, a chance at greatness or maybe just an adventure for the weary nine to fiver. The hard edges of Mt Rainier can be seen unimpeded by cloud cover around a third of the year. But on those lucky days and nights, when the sun is casting a burnt orange glow in the distance and Mt. Rainier is masked in a certain shade of pink, It simply takes your breath away. The pull to breach the walls of my 9-to-5 existence, and even perhaps to stand free – however briefly and spuriously – from the obligations of family, overpowered me. With over 400 summits of Mt Rainier and 25 year of experience, mountain guide and GoTrek owner Craig Van Hoy has had the unique pleasure of taking individuals from the everyday urban dweller to the novice hiker on guided climbs up Mt Rainier. 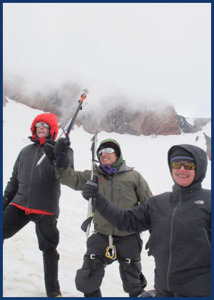 Featured this week is one such climbers experience and journey up the icy edges of the tallest peak in Washington. 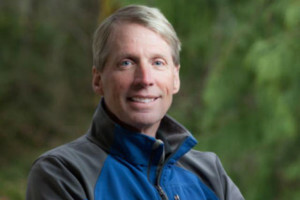 Mark Thorpe’s experience both poetic and telling of the honest challenges a climber faces when taking on a climb like Mt Rainier. His journey inspiring others to break free of their everyday life if only for a few days to adventure up the depths of a mountain so majestic its story can only be felt first hand by the climbers themselves. For three days, I’ve been playing on the glaciers of Mount Rainier, traversing her snowfields, peering into her crevasses, climbing her seracs and plunging my ax into her flanks. Cold but accommodating, she lay quietly beneath my casual violations, disinterested in one man’s attempt at taking her measure – or more appropriately, at taking his own. Now, at 3 a.m., as I shiver in sub-freezing temperatures, gathering the requisite gear for an attempt on her summit, I sense her hulking presence above me, the indifferent giant upon whose icy flesh I’m soon to climb. My confidence, seemingly imperturbable last night, now has the structural integrity of frost. My head is abuzz with vague necessities: crampons, Snickers bars, socks – as well as the unwanted debris of doubt exfoliating from my shrinking resolve. The other climbers are shuffling about in their own private zones or sprawled around the camp, strapping on their crampons, securing their harnesses or fitting their helmets with headlamps. As the sleep clears from my head, I manage to front a semblance of preparedness. After fits and starts, checks and double checks, I slip on my 20-pound pack, find my rope and clip in with the four other climbers assigned to my team. Then, before I know it, we’re taking our first uncertain steps across the Cowlitz glacier toward Cathedral Gap, the beams from our headlamps swinging up and down the snow in an anxious dance of light. Even after I decided to participate in the climb, I could not quite wrap my mind around the idea of climbing a mountain. I had no point of reference. Having been conceived, born and nurtured within the urban sprawl of Los Angeles, I was more familiar with the moral crevasses of the asphalt jungle and the glacial flow of traffic than with actual rock and snow. So, in an effort to put a recognizable face on what I was about to endure, I delved into the literature of climbing, which proved exhilarating – and frightening. On mountains, people die singly and in bunches, with friends and with strangers. They fall into crevasses, get blown off ledges and are felled by tumbling rocks. Their eyes freeze, their lungs quit working, their heads fill with fluid, their fingers and toes turn black from frostbite and they get buried by avalanches, sometimes all during the same trip. While every sport has elements that cannot be quantified or easily explained, in mountaineering a nimbus of death hangs, invisible but palpable, over every step you take. And yet I was compelled to go. The very real possibility dawned on me that I could become another mountaineering statistic, that I could find my way into a hole out of which I might never be pulled. While every sport has elements that cannot be quantified or easily explained, in mountaineering a nimbus of death hangs, invisible but palpable, over every step you take. And yet I was compelled to go. Despite the dangers, a quixotic fascination took root inside me, an enchantment with the stories I read about people for whom no other life than the life of the mountain was possible. And that life, so close to death, seemed exhilarating. The pull to breach the walls of my 9-to-5 existence, and even perhaps to stand free – however briefly and spuriously – from the obligations of family, overpowered me. The climb up Rainier, which lies about two hours southeast of Seattle, started at the Paradise trailhead. Assembled with 22 other hikers in the guide house I received my backpack, crampons, ice ax and headlamp before slogging off along the Skyline trail on our six-hour, 4-600-foot ascent to Camp Muir, our base camp at 10,000 feet. There we spent the next three days acquiring some rudiments of mountaineering, such as self and team arrest (using your ice ax to stop yourself – and your teammates – from falling), pressure breathing (maximizing oxygen intake by forcing air in and out of your lungs with powerful whooses), and the rest step (saving energy by shifting your weight from the leg muscle to the bone structure between steps). I hoped the other members of my rope team paid as much attention to the drills as I did. It takes only one misstep to send an entire five- or six-member team hurtling toward vast unpleasantness. At 14,411 feet, Mount Rainier is the largest volcano in the United States. 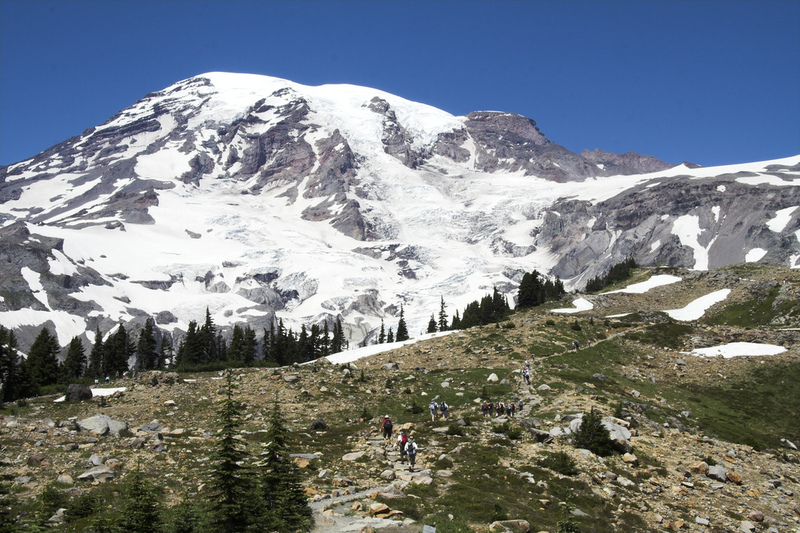 Although there are four higher mountains in the lower 48, none has as much snow and ice as Rainier – or weighs as heavily on the minds of the 10,000 people who attempt to reach the summit each year, a little more than half of whom can claim that unique prize. At such heights, and in such thin air – there is 25 percent less oxygen in the air at Camp Muir than at sea level, and a third less on the summit – the altitude toys with your head, starves your body of oxygen and causes your kidneys to produce more than the usual amount of urine, thus dehydrating you. And traversing snow and ice in these extremes threatens to send you careening down the mountain in an unceremonious heap. In fact, so formidable is the mountain at times that the first American team to reach the summit of Mount Everest trained on Rainier because the weather conditions so closely resemble those found in the Himalayas. As I spent the next few days scrambling over Rainier’s hoary, obstinate head, plunging and arresting, traversing and climbing, developing a false sense of security, I could almost imagine myself in Nepal. Almost. Like distance running or biking, high-altitude climbing tests mental discipline. “The best climbers are the most patient,” says Tracy Roberts, who has led expeditions up Everest and Mt. McKinley. Now, roping-up on the glacier, I wondered how much stamina I had really stored up. When we start for the summit from Camp Muir and cross the Cowlitz glacier, a shot of adrenalin pulses through my body and consumes the fog of sleepiness that has been lingering from three nights of restless sleep. We can clamber up the switchbacks of Cathedral Gap, then stream down the back side in an alluvial fan 11,000 feet up on the Flats of Ingraham Glacier, about a mile from Camp Muir. It’s 4:30 in the morning when I shrug off my pack, pull on my heavy down jacket and start feeding on a Snickers bar. It’s cold on the Flats, the wind is blowing, and my toes are dead to the world. Except for a thin crack of sunburst just rising behind the Stuart mountains, we’re still in the dark. Jessie Williams, the guide assigned to our rope, checks our team – and asks if we’re OK. We nod in affirmation, then slip back into our private thoughts. Ingraham Flats is the first dumping ground. If you opt out the climb at this point, you’re removed from our rope, stuffed into a sleeping bag and dug into the glacier to await the return of a guide. “Bang and tag,” they call it – but nobody is interested. Three rope teams leave before ours, stringing out along the Ingraham icefall, arguably the most dangerous portion of the climb. In 1981, a serac, a tower of ice that forms when glaciers slide down steep slopes and break apart, plummeted down this glacier and started an avalanche that swept 11 climbers into a crevasse, where they remain buried today. It ranks as the worst mountaineering accident in American history, and as I skulk across the Icefall on nervous legs, it rests ominously on my mind. Fortunately, darkness covers the potentially unnerving spectacle, and I pull up at the foot of Disappointment Cleaver (“cleaver” being a rock ridge that separates one glacier from another) anxious but unbowed. When I look toward the summit, I see nothing but interminable fields of snow. Fear, like a fine mist, sifts through my consciousness. I zigzag up the loose dirt and rock of the cleaver, my crampons slipping and sparking, the rope alternating snagging, lurching, pooling into slack and then pulling taut. The paradox of high-altitude climbing is that there is so much to consider – the location of the rope, the position of your ice ax, pressure breathing, rest-stepping, proximity to the person in front of you – yet there’s not enough oxygen in the air for complete mental efficiency. While I’m not so hypoxic at this altitude that I’m near incoherence, I do feel a tightening in my temples. By the time I skirt back onto the snow and ice, the sun is rising spectacularly behind us. To my right, Emmons Glacier, the largest glacier in the continental U.S., emerges from the morning shadow. Foreboding and seemingly impassable, it’s a tumult of crevassed ice. Where an experienced mountaineer might see the wonder of a solvable puzzle I see only anxiety and grief, and am thankful that I’m not making my way through that icy wasteland. When I finally reach the top of Disappointment Cleaver, two and a half miles in the sky, I’ve been anticipating the moment for an hour. For along with the sunlight comes a different perspective of the climb: The slopes steepen, and the dangers, until now obscured by night, seem to beckon. When I look toward the summit, I see nothing but interminable fields of snow. Fear, like a fine mist, sifts through my consciousness. I think of my family, then immediately seek solace in food. But just as the guides had warned, it goes bad in my mouth. During the 15-minute break, I try to force down a peanut butter sandwich, but when it begins to taste like sand, I opt for the fourth candy bar of the day. Maintaining your energy level is vital on long climbs, and altitude, with its affinity for inducing nausea, tends to destroy your appetite. Guides have found that candy bars and potato chips – not sports bars – taste best in thin air. Before wriggling into my pack, I take a few swigs of water from the two quarts I’m packing to the summit. Although I’ve been drinking water constantly the three days prior to the push for the top, I’m hard pressed now to quell the urge to gulp all the water down. Dehydration sneaks up on you at altitude, and I wish I’d stowed a third quart. At 13,500 feet, still 50 minutes from the top, I begin to feel like an anemic pregnant woman: My ankles are swollen, my energy is flagging, and I’m feeling the urge to pee something fierce. although my toes have finally defrosted after six hours of steady slogging, the first dull throbs of an altitude headache beat in my temples. So focused am I on keeping one foot in front of the other, on breathing, on juggling all the information I’ve learned in such a short period of time, that the bowl of the summit catches me by surprise. I drift unknowingly over its lip and into the bulk of our group. People are standing without packs, looking incredibly relieved. Although everybody summits, celebrations at altitude are subdued affairs. There is just not much available energy. And while I am hurting more than I am exhausted – my head and ankles suffering the effects of oxygen deprivation – I’m feeling far from triumphant. I realize the climb to the summit isn’t over. See, you can reach the top of Rainier without actually standing on its highest point. Diehards always make the 30-minute hike across the snowy expands to Columbia Crest, which looks out toward Seattle and Puget Sound and is considered the official summit. Peering down the mountain, I see climbers taking slow, deliberate steps up the slope. A thousand miles to the south, my wife and daughter are beginning their day in the sanctity of our home, and I feel the pull of responsibility that has been temporarily usurped by my need to push the limits of domesticity. Standing atop this tectonic collision that’s lured me to its peak, the ache in my head beating like a Sousa march, I realize that my family is as beautiful and formidable a mountain as Rainier will ever be, and that they are suddenly, entirely, too distant. And yet, despite this longing and my desire to take a few chances as possible, an impulse I don’t fully understand compels me to join the line of climbers heading for the crest. If you find yourself aching for some time in the mountains take a look at some of the local Northwest guided climbs that GoTrek has to offer, and dates for our 2016 Mt Rainier guided climbs are already set. For the travel seekers looking to get their feet muddy abroad, we offer numerous international guided treks and climbs to destinations ranging from Mexico and South America to Southeast Asia, Russia and Nepal. For more information give us a call at (360) 854-8761 or use our contact form to inquire about our upcoming guided treks and climbs.